It’s still not 100 percent, but it’s looking very likely that indeed there will be a P.S. 58 Preschool program for 4-year-olds from Carroll Gardens, in an annex site in the Columbia Street Waterfront District. P.S. 58 Principal Katie Dello Stritto has announced that the N.Y. Department of Education plans to place two classrooms of P.S. 58 siblings in a building at 131 Union Street, between Hicks and Columbia streets. Last year, according to school sources, there were exactly 54 siblings that applied for the 54 seats the school currently provides in three classrooms in the school building. Principal Dello Stritto had said she needs those three classrooms to provide more space for overcrowded third, fourth and fifth grade classes at the school. If the DOE is able to place two pre-K classrooms at the 131 Union St. site, it’s not clear if there will be a third classroom. Dello Stritto has said that she is trying to find space in the school building for the third pre-K class. Carroll Gardens just got too popular for its own good. Due to booming class sizes in upper grades at the local public elementary school, the principal of P.S. 58, the Carroll School, will likely have to eliminate the beloved preschool program for the upcoming 2016-17 school year. In addition, there is no room at the school for new children in the 3rd and 4th grades. The Department of Education will send any new 3rd or 4th graders from the Carroll Gardens zone to a school in Sunset Park, Brooklyn. The school is over its allowed capacity by 219 children, putting it at 129 percent of capacity. A rezoning for the school – like the one currently underway in Dumbo and Brooklyn Heights – could be on the horizon. City Department of Education officials at a recent meeting at the school said there is not currently a rezoning on the table, but conversations may begin soon to address crowding at the school. P.S. 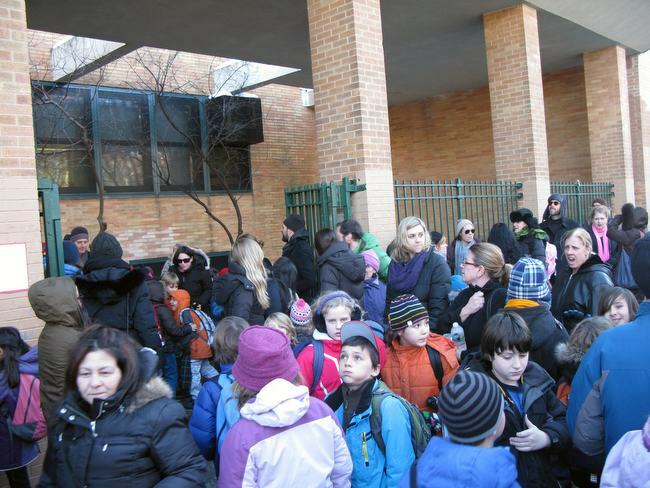 58 Principal Katie Dello Stritto said the three preschool classrooms at P.S. 58 utilize precious space that is needed to alleviate crowding in upper grades. This year, many 3rd, 4th and 5th grade classes at P.S. 58 are bursting with 34 and 35 children, assigned to a single teacher – above the cap of 32 set by the teacher’s union. “Thirty-two is still a lot of kids,” Dello Stritto said. “We need manageable class sizes in the upper grades to give students the support they deserve. “I would love to have pre-K, but having three more classrooms would help manage our class sizes,” she said. Dello Stritto said she is a big fan and former teacher of early childhood education, and would like to continue the school’s program for 4-year-olds. The principal said she is working with the city to find an off-site location for the free, full-day, five-day-a-week preschool. Meanwhile, Dello Stritto said that third and fourth grades at the school are “capped,” meaning that if a new family moves into the P.S. 58 school zone with a child in the third or fourth grade, that child would not be able to attend P.S. 58, because there isn’t any room. New 3rd and 4th graders that move into the P.S. 58 zone will be assigned to P.S. 24 in Sunset Park. The city Department of Education designated that school as the “cap” school for P.S. 58 this year. The school, which features a Spanish immersion program for all students, would require a 30-minute train and bus commute from Carroll Gardens. Dello Stritto said that she must wait until after school starts in September to determine enrollment numbers. If the school is again above capacity for specific grades, and the Department of Education caps enrollment, the city agency will then designate a school with open seats for any new students. “If needed, we don’t know what that school will be next year,” Dello Stritto said. Currently, there are a few seats available in the fifth grade at P.S. 58. But next year, the 3rd, 4th and 5th grades will be capped, unless the preschool is eliminated, Dello Stritto said. “We just don’t have any more classroom space,” she said. The number of kids at P.S. 58, which currently runs from pre-K to 5th Grade, has nearly tripled in ten years, Dello Stritto said, from about 350 children in 2005 to about 1,000 today. Parents continue to pour in from Manhattan, overseas and elsewhere, buying brownstones for $2 million and $3 million, and paying some of the highest per-square-foot prices in the city for condos, coops and rentals; sometimes with hopes of getting a free elementary education for their kids at the sought-after P.S. 58, which houses a competitive and well-known French language immersion program. If an annex location isn’t found for the school’s preschool program, the city Department of Education this summer will assign rising preschoolers zoned for P.S. 58 to other schools in District 15 with open preschool seats. The school this past summer had a wait list for zoned 5-year-olds applying to attend kindergarten – there were 20 children on the wait list. All of the zoned kids who continued to want seats at the school by September eventually were seated, Dello Stritto said; as during the summer, some families moved away and others chose private schools, gifted and talented programs or other school options. “We haven’t yet turned away a zoned student,” Dello Stritto said. But the school is expecting another influx this year. Living near the school is no longer a guarantee to getting accepted, she said. The crowding at P.S. 58 is echoed across the city in upper income neighborhoods with sought-after public schools, such as in TriBeCa, the Upper West Side and Battery Park City. This year, the city Department of Education is proposing to change the zoning of P.S. 8 in Brooklyn Heights after new construction in Dumbo and the popularity of the school saw it’s population balloon. The city is now shifting a large chunk of the P.S. 8 Brooklyn Heights/Dumbo zone to P.S. 307, a school in Vinegar Hill that has until now mostly served children from the Farragut Houses housing project. The zoning change will better balance the number of kids, and the racial/income makeup, between the two schools. The city Department of Education under Mayor Bill de Blasio is expanding the public preschool program across the city. All city kids will get assigned a free public preschool seat; it’s just a matter of where that seat is located. Last year, the city opened seven preschool classrooms at the Bishop Ford Catholic High School in Windsor Terrace, which is a few subway stops away on the F train. City Councilman Brad Lander recently announced that the Department of Education is building a 180-seat preschool center on 9th Street between Third and Fourth avenues, nearby, but that building is at least a couple years from completion. A decision on the matter of closing the preschool at P.S. 58, and finding an annex site to possibly relocate the program, is pending as parents help search for a site, Dello Stritto said. “I’m pushing for it,” Dello Stritto said.